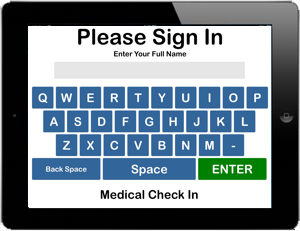 Medical Check In is designed to be easy and fast. Setup is just as easy with no technical experience needed. 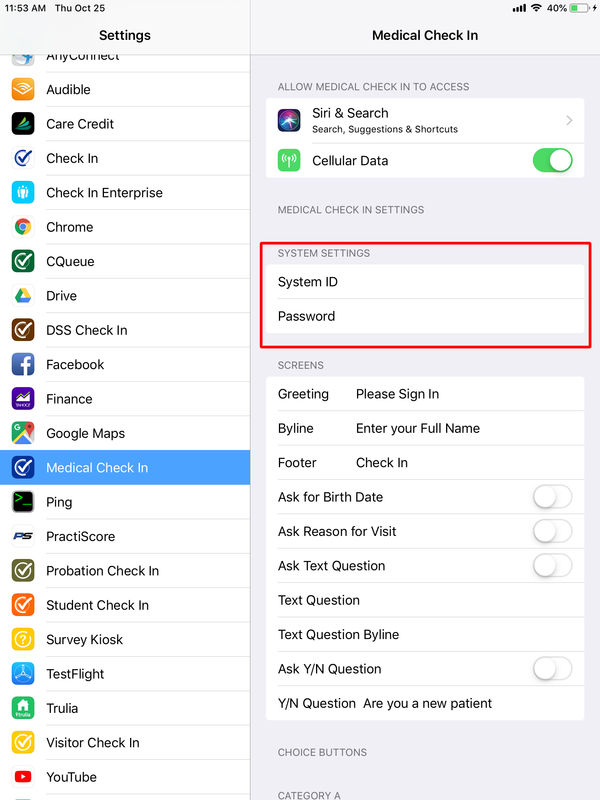 At the top look for the Search box and enter "Medical Check In"
You can ignore the rest of the fields in the iPad for now as they will be synchronized with the server later in these instructions. The easiest way to set the choice buttons is from your online configuration. Log in to the back end and go to Configuration. Set your choice buttons and Save. After you have set your choice buttons in the server side, the iPad can download the configuration making it easy to sync with the server. On the iPad, at the first screen, type UPDATE and touch Enter. Wait about 10 seconds. This will retrieve the configuration from the server. Try a test entry to confirm your choices are in effect. Open the Settings App on the iPad and make these general settings changes. If your stand does not cover the home button, you may want to run Guided Access on the iPad to further secure the app. This will remove the swipe down abilities to open the notifications area and it will lock the home button to a passcode. That's it! Medical Check In is so easy, you should be running in about 15-25 minutes. If you have any trouble, please call us and we are more than happy to help. Your subscription includes unlimited support. Guided Access allows you to secure the home button and restrict access to any other program including the notifications area. Tap on Set Passcode and choose a passcode that only you will know. To get out at anytime, triple tap the home button and enter the passcode. If you find you have trouble with using Wifi, we have a solution to connect the iPad to your network cables. Using an Apple Ethernet adapter and splitter, your iPad can be connected via Cat 5 cable and charge at the same time. Please call us for a kit.